A performance of traditional Balinese gamelan music and dance. 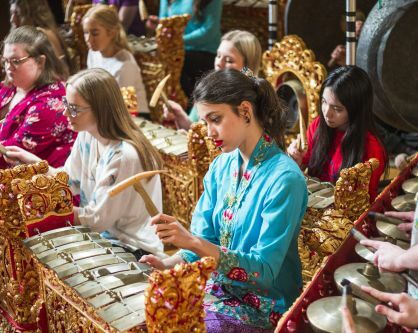 The Balinese Gamelan Gong Kebyar is an ornate orchestra of sonorous bronze gongs and metallophones, which produce an exciting and dynamic music characterised by complex interlocking melodic and rhythmic patterns. Performed by students of City, University of London’s Department of Music, directed by Andy Channing and featuring Balinese dancer Puta Agung Sidhi Narendra.